A while back, it was reported that Microsoft sued Matt Miszewski, the former General Manager of one of its sales teams, as well as his new employer, Salesforce.com, who happens to also be one of Microsoft's direct competitors, to enforce Miszewski's non-compete agreement, and bar him from working for a direct competitor - particularly as their VP of the Global Sector, for one year. From the allegations set forth in the article - and notwithstanding that this case was brought in Seattle (Microsoft's home turf) - this case sounds like the paradigm of a case where a New York court would enforce the non-compete. Moreover, once you see the facts marshalled by Microsoft, it shouldn't surprise anyone that the Court granted Microsoft's application for a restraining order (or "TRO"), banning Miszewski from taking the job at Salesforce. While working for Microsoft, his job duties specifically entailed working with and modifying their "Worldwide Public Sector Government Cloud Playbook," which containing Microsoft's confidential and proprietary sales strategy for marketing Microsoft's cloud computing offerings. Importantly, the Playbook contained vital information regarding Microsoft's evaluation of its competitors in this market - including Salesforce.com. This is precisely the type of trade secret material that New York's courts will look to protect, and the type of non-compete agreement that the New York courts will likely uphold, because to do otherwise would all but encourage trade secret theft and unfair competition. 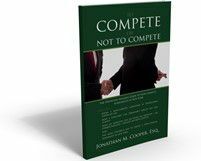 Post a Comment to "When a NY Court Will Enforce a Noncompete - and Grant a TRO"
"Thank you for giving me an honest opinion ... I hope I never suffer another injury - this one was bad enough - but should anyone I know need a good lawyer, I'm happy to send them your way." - Claudia S.Claudia S.